If you don’t know what matched betting is, watch this video or read my introductory post to learn how it works. In a nutshell, it is a risk-free way of making money out of betting offers regardless of the outcome. This post includes everything you need to know about OddsMonkey and Profit Accumulator so it’s quite lengthy. Read it all or jump to the relevant sections using the table of contents below. 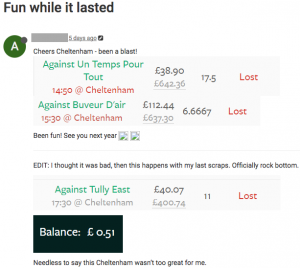 Aw… What an interesting topic matched betting is. I’m sitting in my pyjamas this rainy Saturday morning, skimming through the football offers and making a profit without caring about the outcome! According to my super-secret keyword research tool, the term “Matched Betting” has tripled in popularity in the past 5 years. No wonder more and more people are searching for it if one can make £500-600 every month, risk-free and tax-free. Now let’s get to the point. Matched betting can be hard if done the manual way. By manual, I mean visiting each of the 20 bookmaker websites searching for daily offers. I have to go over the terms & conditions to make sure there is no “catch” and calculate the exact amount to back and lay in order to make a guaranteed profit. This can be very time-consuming and boring. At the end of the day, I’m trading my time for this. So a few websites have started to offer some help with this process. In the past year, I’ve looked at many companies, blogs and ads that try to automate the whole “search for value” thing. I really appreciate what they’re doing and hence I wrote this review showing the pros and cons of each one of them. Of course, MB companies take a cut of around £17 a month. But if they help me make 50 times their fee and free up my time, I’m super-happy to pay them. There are two big players in this game: OddsMonkey and Profit Accumulator. OddsMonkey costs £17.99 per month or £150 per year (£12.5 per month). It offers a free service with introductory training guides without having to enter any card details. Profit Accumulator costs £17.99 per month or £150 per year. So same price with OddsMonkey. They also offer a free service covering training but with limited access to offers. Signing up to new betting websites are a great way of making quick money. This is because bookmakers try to hook you in by offering generous free bets to make you stick with them! My first months were my favourite as I could earn a very good profit with minimal effort. I think I made around £800 in the first month. I only sign up to a bookie if they are licensed and regulated by the Gambling Commission. You can usually find this information at the bottom of their website as well as their license number. Additionally, I feel they’re trustworthy if I’ve seen some TV ads, team sponsorships or have heard them before. I also require they exist for more than a year. 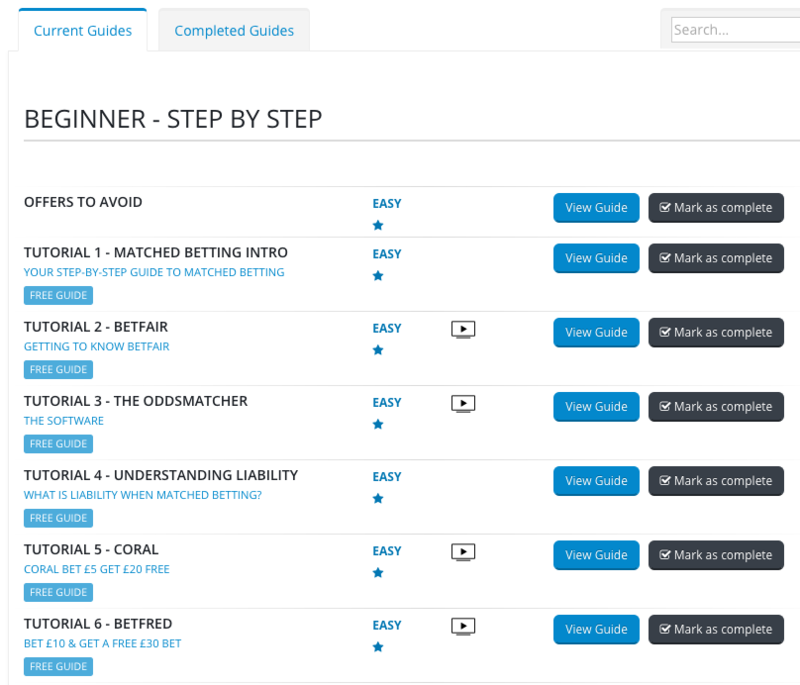 OddsMonkey offers a step-by-step guide to matched betting for the complete beginner. It starts with a text-only introduction to matched betting, explaining how it works and guiding you through the tutorial. Then it introduces you to Betfair, which is a betting exchange – a place to bet on the opposite side of any bet. It almost feels like holding your hand when taking your first steps to understanding liability, signing up on a betting exchange, understanding the Oddsmatcher tool and finally making some dough using Coral and Betfred. I find it very easy to learn why I’m not risking any money here and understanding the whole picture. The video tutorials certainly help and OddsMonkey videos are detailed and easy to follow. As you can see they rate offers as Easy, Medium or Hard. Each offer gets its own text or video guide explaining the whole process. What I love about each guide is that little window at the bottom. This is quite useful as a beginner. The most important points of each offer summarised in a box. I should definitely know I must “double check I’ve placed the bet” because this particular bookie has a known problem on their website. 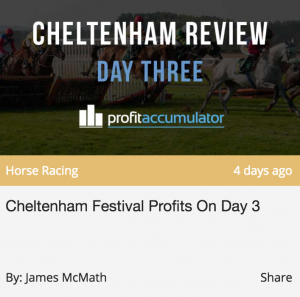 Profit Accumulator does a great job introducing the beginner to matched betting. The first post is a 14-min essential training video to the topic. As expected, the video teaches you how to back and lay, claim a Coral offer and make some profit from the free bets. You can start working your way down the 64 different offers. Some of them include video instructions too. The offers are up-to-date and bonus points to PA for showing seasonal offers such as the Blacktype sign-up offer during the Cheltenham Festival. Despite the fact Profit Accumulator presents each offer in detail, I think OddsMonkey does a better job breaking down the offers into different types and difficulty levels. When matched betting, you want to complete as many offers as possible in your limited time. You also need to place bets on the bookies and lay them at a booking exchange. The most popular one is Betfair. 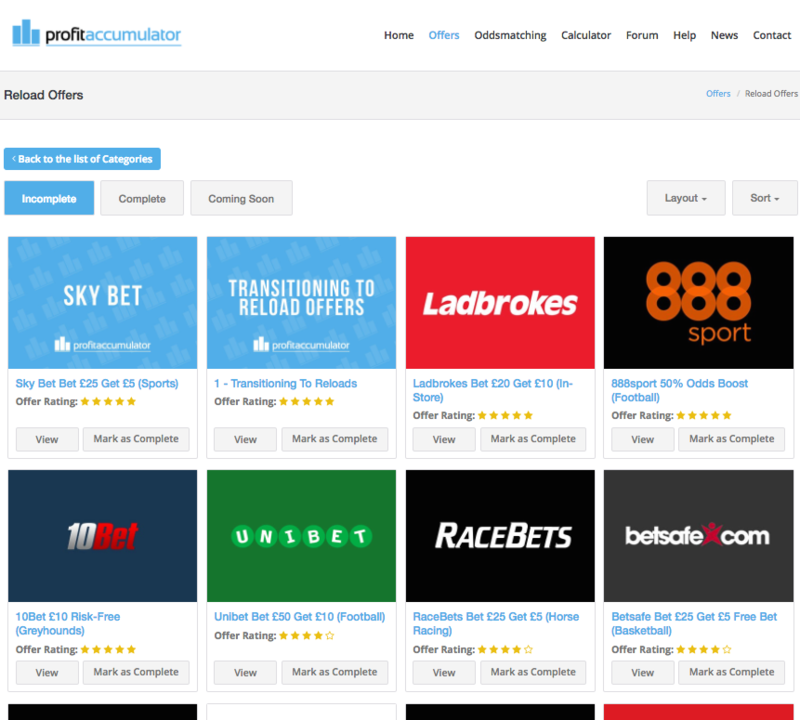 Both OddsMonkey and Profit Accumulator have partnered with Betfair to allow people to place bets INSIDE the tool. This is a huge time saver because you can place your bets without having to leave OddsMonkey or log in to Betfair. You no longer need to flip between screens to lay bets. Plus if the odds change it calculates the new amount automatically. Magic! By the way, sign up using this affiliate Betfair link to get 0% commission up to £50. I believe that’s better than signing up using the Bet £20 Get £20 offer. That’s like earning £20 vs saving £50 which of course, is more money in the pocket. Update Sept 17: OddsMonkey now offers a Betfair discount from 5% commission to 2%. This may sound small but it’s huge savings if you bet a lot. Let’s say you back and lay a total of £5,000 a month which is not unusual. Then 3% discount means £75 saved if half your bets win! Well done OddsMonkey and Profit Accumulator for integrating with Betfair, looking forward to more time-saving techniques like this one. 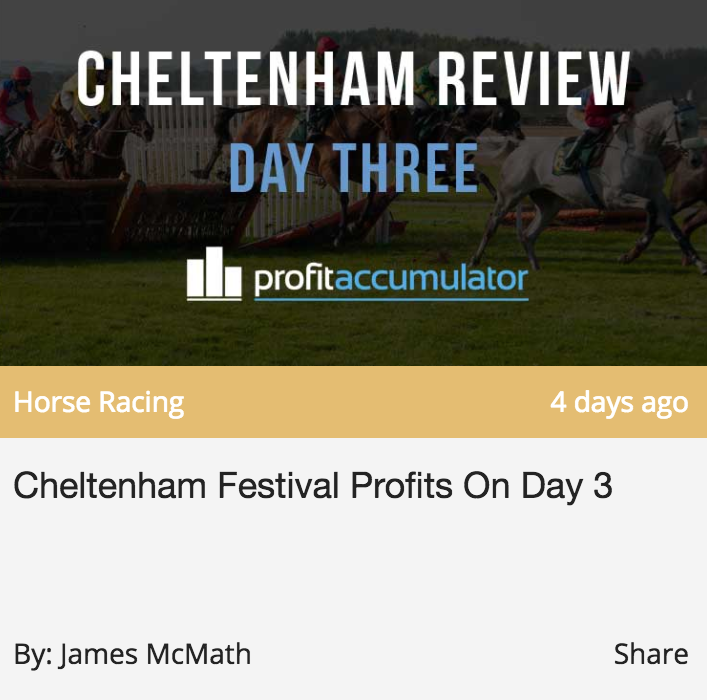 But the recent Profit Accumulator partnership with Matchbook is actually better (0% commission). Matched betting typically allows you to bet on an outcome and bet against this outcome on a betting exchange (such as Betfair). I assume you know how it works (otherwise watch this quick video before moving on). The better the rating, the better the result. DO NOT bet on reds… these are arbitrage opportunities and will get you banned before you know it. Keeping the qualifying losses as low as possible and retaining most of the free bet value is critical to your success. Both OM and PA provide the usual OddsMatching software. This is extremely useful when you’re starting because it saves an enormous amount of time (or money depending on how you look at it). 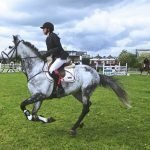 OddsMatching software: There is no real difference between them, which sometimes makes me wonder: Are these guys behind the same company? As you build up your experience as a matched bettor you want more and more value in less time. Ultimately, the satisfaction of “beating the bookie” fades and money is the only thing that matters. You’re just hungry for more. This is the point where you need a service that cuts to the chase. Login -> Show me the offers and the catches -> Profit. The dashboard is a great interface by OddsMonkey. When I log in I get an overall view of what’s going on today, then I dig deeper into individual offers if needed. The Current Offers is an invaluable daily resource that shows me what I should choose for the biggest profits every day. Probably the biggest reason I’ve signed up with OddsMonkey. 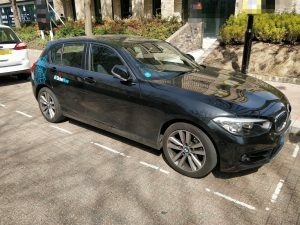 The £ blue box shows the offer’s guaranteed profit. For casino offers, (not shown in the pic) there is a black box showing the offer’s expected profit. Casino offers can give big returns but also losses too. But in the long term, you will end up a winner (similarly to how real casinos end up winning, and only a handful of gamblers luckily beat them). If you’re a beginner start with guaranteed profit and work your way to casino offers. Clicking on each offer opens up a new window with a short but comprehensive strategy to execute it. Your matched betting progress is shown in the middle (which I don’t really pay attention to). After a while, your eyes will be trained to skip this part. Maybe it’s quite motivational for when you’re starting. Then on the bottom left, I get a quick view of the most recent posts in the forum. Usually, the hottest promotions are on the top, because many people discuss those in detail. As you can tell, I really enjoy this interface, and OddsMonkey does a good job of keeping it updated and improving it all the time. As you can see from the image below, Profit Accumulator provides a basic interface that covers all aspects of matched betting. Compared to OddsMonkey it is more lightweight and static. Reload offers is usually where I spend most of my time as I have completed most of the sign-up offers I want. 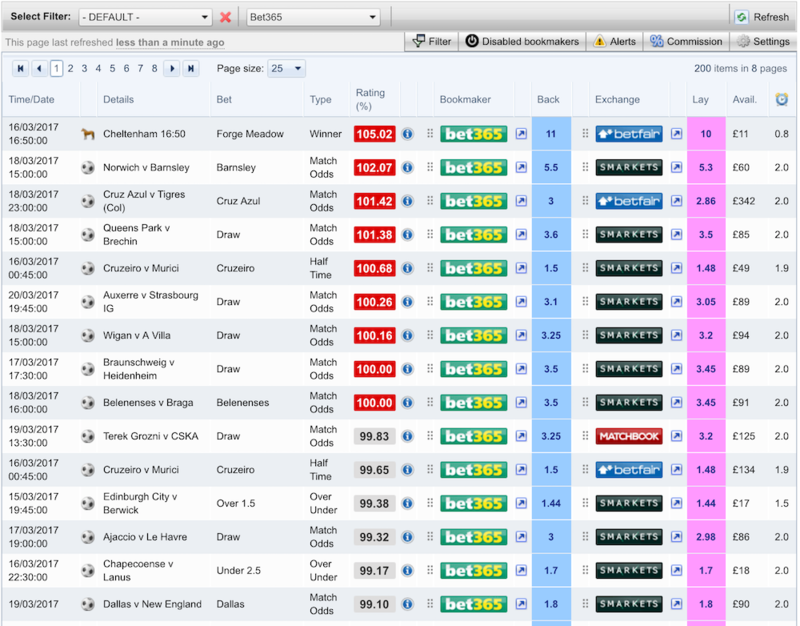 It requires a few more clicks to find what I want but Profit Accumulator offers a very similar quality to OddsMonkey. As expected, each offer comes with its own description and strategy but PA does not always show the expected profit. I think it would be great to clearly see how much I can make at a glance. OddsMonkey is a winner in my opinion. I really enjoy the clean interface and the usability aspect of it. It almost feels like I’m playing a game. I am more of a “guaranteed profits” type of guy, but casino offers can be a huge boost to your winnings. Never underestimate the power of Expected Value. Sure, there are ups and downs but the odds are in our favour with casino offers. 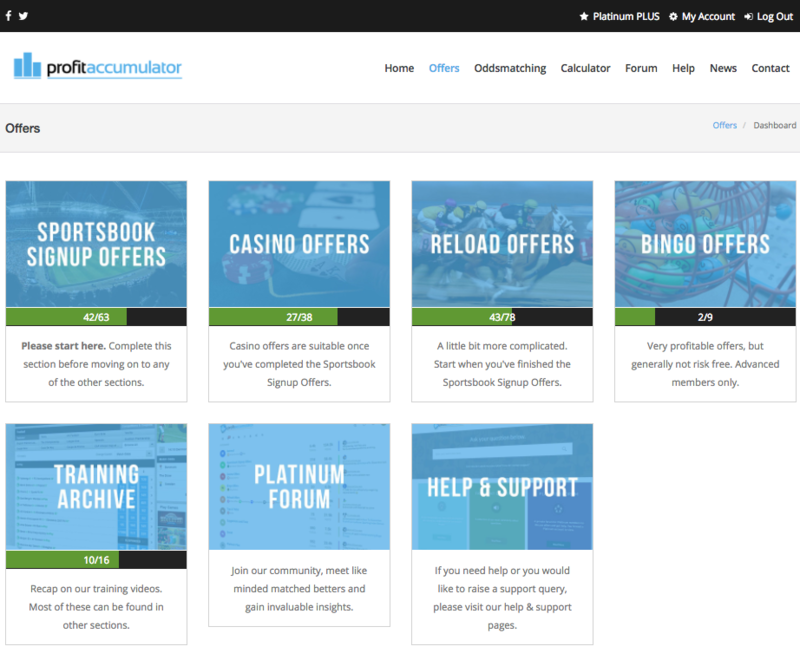 As you saw above, Profit Accumulator provides a large selection of casino offers to choose from. 38 to be exact. OddsMonkey, on the other hand, provides only 14 of them – the most popular. Having said that, OM provides some extra daily casino offers as part of the “Current Offers”. So it may not provide all sign-up casino offers but right now I’m looking at 11 daily casino offers to compensate for that. If I were to go all in on casinos I’d probably choose Profit Accumulator for my strategy. The forum technology is exactly the same which gets me thinking again: ARE THESE 2 GUYS BEHIND THE SAME COMPANY??? Joking aside, the community is strong, vibrant and growing in both services. Profit Accumulator has been around for longer and the number of posts reflects that. The forum is an amazing resource to have. Every single offer gets its own thread on the forum. You can discuss any catches, questions, how easy it is to score a small qualifying loss, and much more. More often than not, the questions are answered accurately by the members of the community before the forum admin knows about it. This is great! Well, actually the guy did not lose any money but ended up having almost nothing on the exchange and winning big on the bookmaker’s side. That’s not so desirable, because a) you have to withdraw large amounts from the bookie and this draws suspicion. b) it can take up to 5 days for them to transfer the cash – until then you’re out of business! When it comes to having issues that cannot be resolved on the forum or are private, you can raise a ticket and get answers by e-mail or contact them directly on twitter and facebook. Here are a few Oddsmonkey reviews. I couldn’t find any reviews for Profit Accumulator. Trustpilot is the reviews website I usually trust but these companies are not present there yet. I feel this is a tie. Profit Accumulator has more posts because it’s been around for longer but day-to-day is what matters and OddsMonkey provides a good service. OM allows you to book a 30-minute one to one training session (see here) for free in the first month of your membership. It really cannot get more personal than that! Blogging is one of my favourites. The encouragement I get from reading their posts makes it worth reading once every week or so. The biggest motivation is Ben’s Matched Betting Diary. This is a simple page published every day, that shows how a guy called Ben makes his £20 profit. That’s £600 per month. Usually, this is down to completing 1 or 2 daily offers and it’s extremely valuable to both new and existing members. It’s actually free to view for non-members too, including the offers and strategies he used. 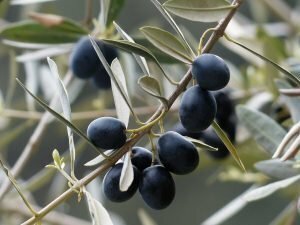 Reading that once per month, I learn about different ways I can use OddsMonkey and keep up with the changes. It also gives me a huge psychological boost knowing that making a monthly hefty profit is not so hard after all. 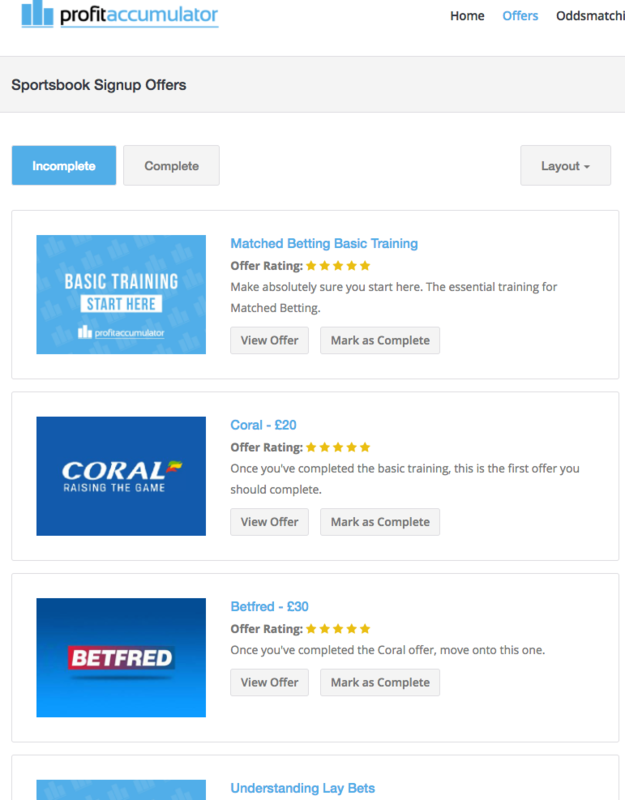 Apart from that, the blog discusses more advanced tools (for example, the each-way matcher), news about betting, whether matched betting is legal, horse racing tools, how to avoid account restrictions and other useful goodies. PA provides a slightly different experience when it comes to free content. It’s more of a sports and betting news and magazine type of service, that is definitely updated more often than OddsMonkey but with broader topics. There you can find news about Boxing, Cricket, funny stories, money-saving tips, even advice on managing your bankroll. If you’re a sports fan then you’ll probably like it a lot as it mixes content with matched betting, which is the reason we visited in the first place! I should probably mention the occasional newsletter PA sends. I really like receiving an e-mail packed with valuable offers and links to the PA page rather than having to log in and check every now and then. There’s definitely more content on the Profit Accumulator blog and the newsletter is awesome. However, OddsMonkey covers all things matched betting and Ben’s diary makes it a good reason to stick with. This section is quite a niche. 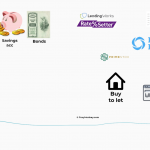 It refers to the tools needed to boost your income to over £1000. They often require more time and effort and you should only try them after 2-3 months of your matched betting career! Extra Place bets are those horse-racing and golf bets where the bookies offer to pay out on more places than usual. To put it simply, there are offers that pay 1/4th the win odds for finishing in the first 4 places. The value exists when the bookmakers offer to pay the first 5 or 6 places instead! So, if you lay the first 4 places, but back the first 6 places, you see how you make a profit. The process has been extremely simplified by OddsMonkey. They created a tool where you can see all the available extra place offers. It also displays the stake you need to bet and the expected profit if your horse finishes in an extra place. Bonus points for saving your bets for future reference. Dutching is a slang for the following process. Instead of backing a bet and laying at an exchange, you back all outcomes on different bookmakers. Basically, this results in extra profit because bookmakers odds vary. By backing Player A at Bet365 and same stake on player B at William Hill, not only we don’t use an exchange but we make a guaranteed profit out of the difference. 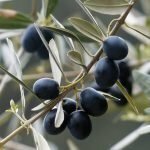 OddsMonkey offers a dutching tool that shows you all such opportunities. It shows how much to bet on each outcome as well as your guaranteed profit. Profit Accumulator does not offer a dutching calculator yet. The eachway matcher especially is a tool which creates unbelievable value for matched betters. 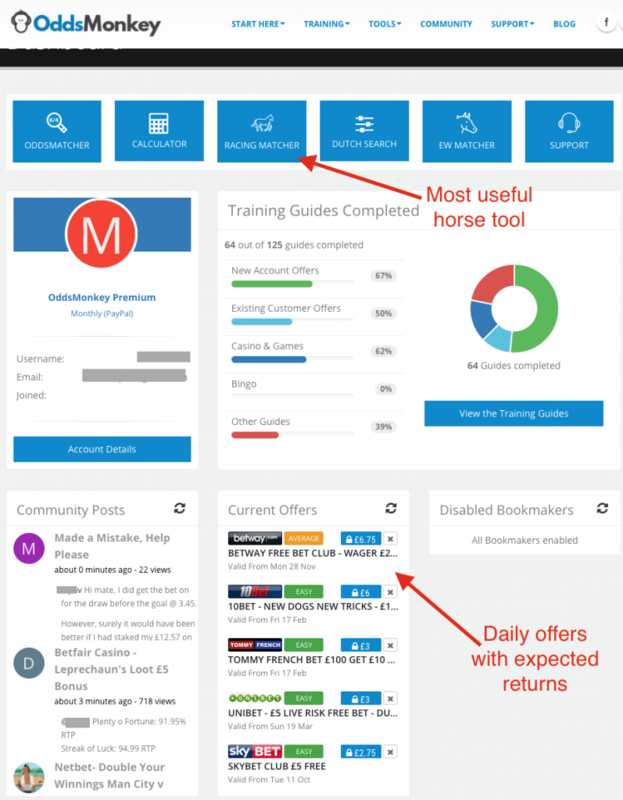 If a matched betting site is not offering this, then they are not offering the best tools on the market for their members. Read my new guide: The Each Way matched betting guide: More Profit, Less hassle. This is mainly used to take advantage of gubbed accounts but can be used in healthy ones too. In other words, if a bookmaker bans you from using their offers, you can still make a lot of money by using the Each Way matcher tool. 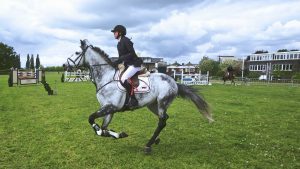 An each-way bet is a type of horse bet, where you place a stake on a horse to win, plus the same stake on a horse to be placed (to finish in the first X positions). Again there is value to be had here and the EW matcher tool can return between £200-2000 per month (depending on your stakes). Some people, only use the Each way no-lay method for matched betting. They make more money on their gubbed accounts than on their ungubbed ones! Be careful when using the Eachway matcher. Mistakes are costly because usually, the stakes are high. Watch all the videos first. We’re lucky this tool exists and OddsMonkey is the only service offering it so far. A massive part of the advanced matched bettor profits is made using the accumulator tools. This extracts the value out of multiple bets that offer your money back if one of the 4 or 5 legs lets you down. There are plenty of different ways to play this and I won’t go into more details here as this post is already too long! The OddsMonkey Acca tool is included in the £15 monthly membership fee. Profit Accumulator used to charge an extra £17.99 a month but they no longer do. As you can see, 2 out of the 3 services are not offered by Profit Accumulator. OddsMonkey is way ahead when it comes to advanced matched betting and the more you build your expertise the more you will need those tools. If you’ve never heard of the word Affiliate Scheme before, it’s a good way to make money from anything. When you advertise a service (as I’m doing right now for them!) you can get money if you sell on their behalf. This can be anything, from Amazon products to groceries etc. OddsMonkey and Profit Accumulator run their own affiliate scheme to incentivize people to bring their friends and grow their platforms. If you become an affiliate partner, all you have to do is to share your unique link with others and earn a 50% commission if they sign up. You can view your earnings online, as well as how many people clicked on your links and get paid in cash. OddsMonkey is a winner here only because it allows you to link to any page of their website, unlike Profit Accumulator where you can only link to their homepage. However, given that PA monthly is slightly more expensive (monthly), you can get more money for your efforts. All things considered, these guys do a great job saving a huge amount of time for us. A £17.99 fee (OddsMonkey or Profit Accumulator) feels like nothing once you’re making £500 using their services. 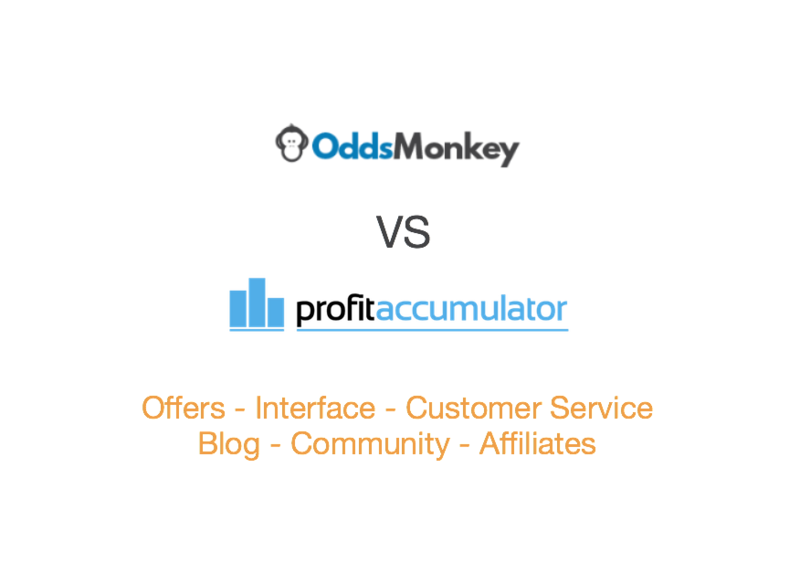 Personally, I use OddsMonkey for most of my matched betting, although I’m subscribed to both services. When it comes to interface and usability OddsMonkey is more fun to play with. The difficulty rating combined with video instructions and the tooltip window makes the process very straightforward. As a beginner, you can just pick the first few offers and start making money immediately. 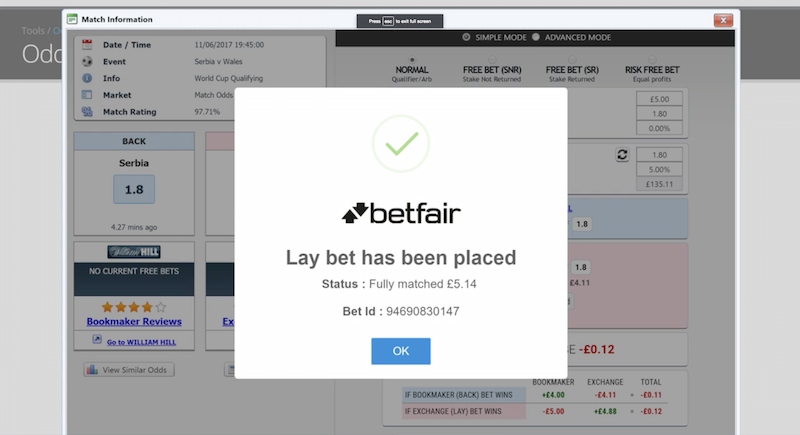 Both tools though integrate with Betfair which means laying a bet by clicking a button without having to leave the matched betting website. Profit Accumulator has the upper hand in casino offers which can be profitable if you’re a motivated advanced player. 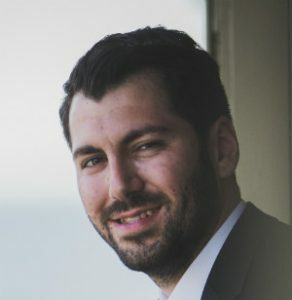 Speaking of motivation, OddsMonkey fights back with Ben’s diary which demonstrates how he uses simple strategies to make at least £20 per day (£600 a month). Combine that with the 30-minute free one-to-one session and you have the best matched betting software as of today. Last but not least, you can magnify your profits by introducing other people to matched betting. You can become an affiliate partner and earn a commission if people sign up. On a similar note, if you liked my “OddsMonkey vs Profit Accumulator” review may I ask that you sign up using my links so I can get paid too? I’ll be very grateful if you do. Matched betting is easy and can be very profitable. Do not be intimidated by the “betting” aspect of it, start slow and work your way up as I did. Oh and ask for help! I am happy to answer any questions you may have. You may want to check another service I just started using: Matched Bets. They are the only ones that offer live chat support and look promising. I will have to use them for a few months before I write a complete review. 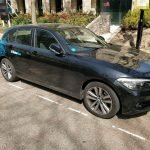 Cost is £14 per month or £99 annually. Been matched betting for about 3 months and made £600 doing everything manually so really need to sign up to one of these and hopefully increase the amount I’m making each month. Still slightly torn after reading this though! You should see a massive difference if you start using OddsMonkey or PA!